The Bedford Rotary Ideas Community Challenge (BRIC2) is a new annual service activity in Bedford, Hanscom AFB and Boston. With BRIC2, we seek to enable students to take on sustainable projects that will solve challenges and improve life in our community. Contest planning packets (with a problem-solving framework and points of contact with key community groups) will be given out to interested students at the beginning of the school year. 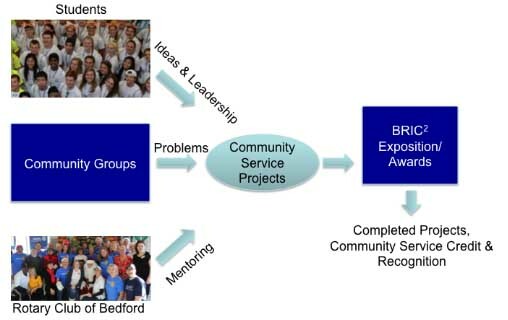 A BRIC2 committee will initially work with the teams and their community partners to help them identify challenges and develop their solutions, culminating in a celebration of service at the spring BRIC2 exposition and awards event. If funds are needed for the purchase of materials/equipment, they may apply to the BRIC2 committee or other town funding sources. Once projects are completed, they will be eligible for the BRIC2 exposition and awards.